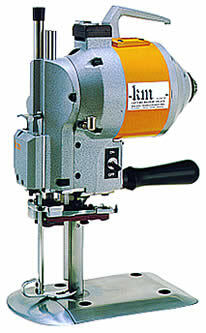 The KM EU 6 has all the features of the big industrial straight knife cloth cutting machines but is supplied in a smaller and lighter package which is easier to operate and highly manoeuvrable. The machine has been specially designed for users who are cutting small lays of up-to 110mm in depth. 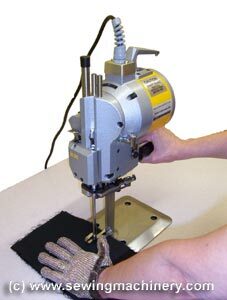 It features a shorter than normal knife stroke which operates much better on small lays and reduces the cutting warp which is associated with bigger machines. The KM EU is manufactured & assembled in Japan. It is built to last & with correct use and care it will give you years of service. 4 x independent base plate rollers. Push button automatic blade sharpener. Quality Japanese manufacture and assembly. Low servicing & maintenance costs.